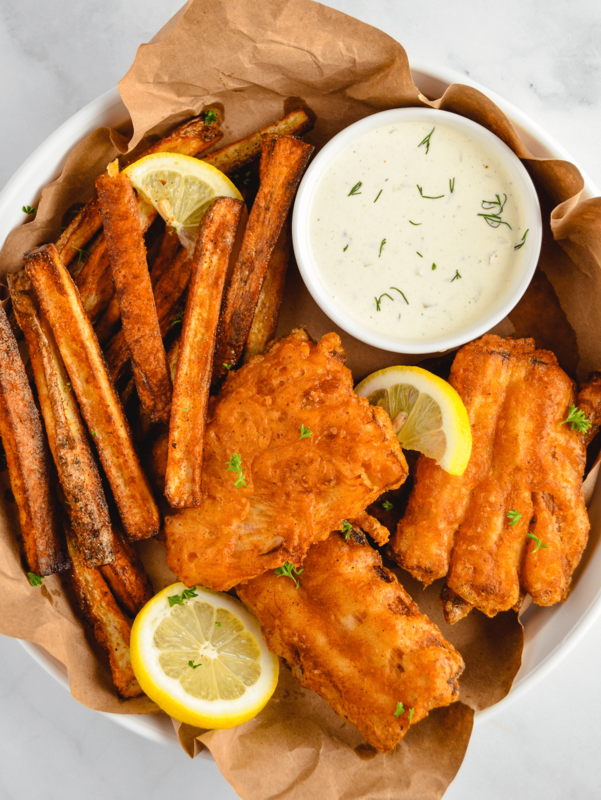 Vegan fish and chips with a light and crispy beer batter. Full of authentic flavor, flaky hearts of palm “fish” and chips tastes just like the real thing! Vegan’s resourcefulness for finding plant-based meat replacements that are almost identical to the real thing always amazes me. Like these jackfruit carnitas tacos that are 100% vegan for example. But of all the vegan meat replacements, fish is the last thing I thought I would find a worthy replacement for. The flaky texture of fish is completely unique – or so I thought. But it turns out there’s actually some amazing fish substitutes out there that mimic the look and feel of fish perfectly! So naturally, I had to try these out for myself and what better way to do that than with some delicious fish and chips? What is vegan fish made of? Banana blossom and hearts of palm are the two most common vegan fish replacements for fish and chips or fish sticks. They both have a soft, flaky texture that makes them feel very close to the real thing. Banana blossom is a flower that is most commonly found in Southeast Asian cuisine. It has a flavor sort of reminiscent of artichoke. Hearts of palm is a tropical vegetable harvested from palm trees with a tender texture and a very mild flavor. You probably haven’t heard of it but hearts of palm can be found canned in almost any supermarket! As far as vegan fish and chips goes, I prefer to use hearts of palm over banana blossom. It’s subtle taste doesn’t interfere with the flavor of the batter and it is easier to find at a standard supermarket. Preheat oven to 450 F and place the beer in the freezer. While the oven preheats, wash the potatoes then cut into thick french fries. The easiest way to do this is to remove the ends of the potato, then slice a thin piece off of each side so you’re left with an even rectangular potato. Add the fries to a baking sheet with a large drizzle of high heat oil, then sprinkle with fry seasoning (equal parts paprika, garlic powder, and onion powder) to taste. Once the oven has preheated, bake the chips/french fries for 30-40 minutes or until crispy on the outside, flipping them halfway through. While the chips bake, prep the hearts of palm into “fish” fillets. Start by draining the can, then push the “cores” out of the middle of each hearts of palm cylinder. Run your knife down the thin side of the cylinders to open them up, then flatten them out with your hand. Hand shred the hearts of palm cores and place on top of the flattened hearts of palm fillets. This will help add volume and texture to your “fillets”, and there’s no need to waste the cores! Heat a 1 inch layer of high heat oil (I used peanut oil) in a large pan over medium-high heat. Prep the batter by mixing together all dry ingredients: 3/4 cup flour, 1/4 cup cornstarch 1 tsp baking powder 4 tsp Old Bay seasoning. Once the oil has heated (to test this add a drop of batter to the oil to see if it bubbles), remove the beer from the freezer and slowly whisk it into the batter mixture. Continue to slowly add beer while whisking until your batter is thick and combined, but still slightly lumpy (I used about 6 oz or half of a beer). Sprinkle or dip both sides of the hearts of palm fillets with flour then dunk them into the beer batter. Completely coat the fillets with batter, allowing any excess batter to drip off. Place the beer battered fillets in the hot oil. Fry about 4-5 minutes per side until golden brown and crispy. Work in batches as needed so that the pan isn’t too full. When finished, place the fried fillets on a cooling rack to allow excess oil to drain off. There are a few important things to keep in mind if you want your vegan fish and chips to taste as authentic as possible. Here’s a couple of chef secrets to help you make the perfect fish and chips everytime! Beer Is Key: The secret to the best fish and chips is the beer. The bubbles in the beer give the batter a super light and crunchy texture when fried. Lighter beers like pale ales, lagers, or pilsners work best for fish and chips. Keep It Cold: Keep the beer cold until you’re ready to fry. You want a high temperature difference between the beer batter and the frying oil for the perfect texture. Make It Fishy: Want an even more authentic fish and chips experience? You can add ground kelp as a seasoning to the batter or wrap the fillets in nori (seaweed) before dipping them in the batter. This will add a bit of “fishy” caught from the sea taste if you want that flavor. Get more awesome vegan dinners! With so many amazing vegan recipes out there, it is easier than ever to stick with a healthy plant-based diet. If you need some more delicious vegan dinners ideas, try out this vegan sweet potato gnocchi with creamy rosa sauce or these vibrant falafel buddha bowls! But what if you don’t have time to constantly scour the internet for new recipes that may or may not be good? Don’t worry, I’ve got you covered! For my busy readers out there, I definitely recommend checking out Green Chef. They are a USDA Certified Organic meal delivery plan with tons of dietary options, including a dedicated vegan meal plan! Each week you get 3 chef-inspired recipes with fresh pre-measured, pre-prepped ingredients delivered to your doorstep. Each healthy and delicious recipe is ready in around 30 minutes! Green Chef is a super easy and time saving way to stick with a healthy diet. Oh and did I mention you can currently get $40 OFF your first order! Preheat oven to 450 F and place the beer in the freezer. While oven preheats, wash the potatoes then cut into thick french fries. Add fries to a baking sheet with a large drizzle of high heat oil, then sprinkle with fry seasoning to taste. Once oven has preheated, bake the chips/french fries for 30-40 minutes or until crispy on the outside, flipping them halfway through. While the chips bake, prep the hearts of palm into “fish” fillets. Start by draining the can, then pop the “cores” out of the middle of the hearts of palm cylinders. Run your knife down one side of the cylinders to open them up, then flatten them out with your hand. Hand shred the hearts of palm cores and place on top of the flattened hearts of palm fillets. Heat a 1 inch layer of high heat oil (I used peanut oil) in a large pan over medium-high heat. Prep the batter by mixing together all dry ingredients. Once the oil has heated (to test this add a drop of batter to the oil to see if the oil bubbles), remove the beer from the freezer and slowly whisk it into the batter mixture. Continue to slowly add beer while whisking until your batter is thick and combined (I used about half of a beer). You should still have a few lumps in the batter here and there. Sprinkle both sides of the hearts of palm fillets with flour then dunk them into the beer batter. Completely coat the fillets with batter, allowing any excess batter to drip off, then place them in the oil. Fry about 4-5 minutes per side until golden brown and crispy.